#1. This week's number one is an international point guard Mouloukou Souleyman Diabate (181-87, currently plays in France). Diabate led Sluc Nancy to a 3-point victory over the 12th-ranked Poitiers (6-9) 76-73 in the French ProB (second division) in Saturday night's game. He was MVP of the game. Diabate scored 16 points and added 4 assists. Sluc Nancy Basket Pro (10-5) is placed fourth in the ProB. It was his team's third consecutive victory in a row. Diabate has relatively good stats this season: 10.7ppg, 1.7rpg, 3.7apg, 1.7spg, 2FGP: 40.9%, 3FGP: 33.3%. He is currently a member of the Ivorian senior national team. #2. Second place goes to an international center Louri Frejus Zerbo (208-89, currently plays in France). 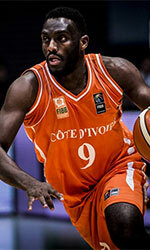 Zerbo could not help JL Bourg (14-3) to beat SIG Strasbourg (8-8). He scored only 4 points and grabbed 7 rebounds in 32 minutes. JL Bourg lost 71-76 on the road to the much lower-ranked (#10) SIG Strasbourg. This year Zerbo averages: 0.6ppg, 1.7rpg in seven games he played so far. He has a dual citizenship: Burkinabe and Ivorian. Zerbo is in the roster of the Ivorian senior national team. #3. The Ivorian player who performed third best last week abroad was former international center Aboubacar Aboubacar Hima (207-94, currently plays in Spain). Aboubacar Hima contributed to Carramimbre's victory against the 13th-ranked Leyma Basquet (8-12) 75-65 in the Spanish LEB Gold (second division) in Friday night's game. He scored 6 points and grabbed 8 rebounds in 18 minutes. Carramimbre CBC Valladolid (11-8) is placed seventh in the LEB Gold. It was his team's fourth consecutive victory in a row. It's Aboubacar Hima's first season with the team. This year Aboubacar Hima's overall stats are: 3.9ppg, 4.6rpg, 2FGP: 45.6% and FT: 55.0% in 19 games. He played for the Ivorian national team two years ago. #4. Center Cedric Bah (198-94, currently plays in France) managed to help BC Souffelweyersheim to win against the 14th-ranked GET Vosges (4-15) 86-70 in the French NM1 (third division) last Friday. Bah recorded only 4 points and grabbed 8 rebounds. BC Souffelweyersheim (18-1) is placed first in Group A. It was his team's 16th consecutive victory in a row. This season Bah has relatively solid stats: 10.7ppg, 6.0rpg, 1.4apg, 1.2bpg and 1.2spg. He used to play for the Ivorian national team back in 2017. #5. International forward Tiegbe Bamba (204-91, college: Portland St., currently plays in Iceland) was not able to help one of league's weakest teams Grindavik in their game against Keflavik (13-4) in the Icelandic Dominos League. Bamba scored 8 points and grabbed 10 rebounds in 30 minutes. Grindavik lost 77-88 on the opponent's court to the leading Keflavik. Bamba has individually a very good year with high stats. He averages: 15.7ppg, 9.6rpg, 2.4apg and 1.2spg in nine games. Bamba is another player who holds two passports: Ivorian and French. He plays currently for the Ivorian national team. #6. Forward Moussa Kone (203-93, college: Hofstra, currently plays in Spain) was not able to secure a victory for Palencia Baloncesto (11-8) in their game against Barca II (6-13) in the Spanish LEB Gold (second division). Kone was the second best scorer with 8 points. Palencia Baloncesto was badly defeated 81-63 in Barcelona by the much lower-ranked Barca II (#15). It was Palencia Baloncesto's fifth consecutive loss in a row. Kone's total stats this season are: 5.7ppg, 4.3rpg and 1.1bpg. He has both American and Ivorian nationalities. Kone is a former international player as he played for the Ivorian senior team four years ago. #7. International point guard Bryan Pamba-Juille (184-92, currently plays in France) couldn't help Chorale de Roanne (12-3) in their game against Paris (6-8) in the French ProB (second division). He cannot count Friday's game as one of the best ones. Pamba-Juille scored only 3 points. The league leader Chorale de Roanne was defeated 79-75 on the opponent's court by the much lower-ranked Paris (#11). They ended the series of six consecutive victories. This season Pamba-Juille averages just 2.2ppg. He is also Ivorian national team player. #1. Bazoumana Kone (193-G-93, college: Bremerhaven, currently plays in Germany) could not help Braunschweig (5-4) in their last game. Despite his very good performance Braunschweig lost 94-99 on the road to the one of league's weakest teams (#17) Crailsheim Merlins. Kone was the second best scorer with 17 points. He also added 4 rebounds and 7 assists in 26 minutes. This year Kone averages: 5.4ppg, 2.1rpg and 1.5apg in 11 games he played so far. He has a dual citizenship: Ivorian and German. Despite Kone's Ivorian passport, he previously played for the German university national team and is probably not eligible to play for the Ivorian team. #2. Experienced Alain Koffi (207-C-83, agency: BeoBasket, currently plays in France) contributed to an easy victory against one of league's weakest teams Provence Basket (4-13) crushing them 88-62 in the French Jeep ELITE last Saturday. Koffi scored 9 points and grabbed 4 rebounds. BCM Gravelines Dunkerque Grand Littoral (11-6) is placed fourth in the Jeep ELITE. It was Gravelines-Dunkerque's sixth consecutive victory in a row. Koffi has relatively good stats this season: 10.8ppg, 5.6rpg and 1.1apg. He is another player who holds two passports: Ivorian and French. #3. Mohamed Bamba (211-F-98, college: Texas, currently plays in NBA) was not able to help the Orlando Magic in their game against the Brooklyn Nets (26-23) in the NBA. Bamba scored 9 points and grabbed 4 rebounds in 15 minutes. But the Orlando Magic (20-28) was edged 117-115 in Brooklyn by the Nets. This year Bamba averages: 6.4ppg, 4.9rpg and 1.4bpg in 43 games. He has both American and Ivorian nationalities. Despite Bamba's Ivorian passport, he previously played for the USA U18 national team and probably cannot be called to the Ivorian team. #4. Jonas Bergstedt (208-C-91, currently plays in Hungary) was not able to secure a victory for TF Budapest (1-15) in their last game on Sunday. Despite his very good performance the bottom-ranked TF Budapest was badly defeated 83-63 at home by the much higher-ranked ZTE KK (#5). Bergstedt recorded a double-double by scoring 17 points and getting the same number of rebounds (made all of his five free throws). It's Bergstedt's first season with the team. He has individually a very good year with high stats. Bergstedt averages: 16.2ppg, 11.3rpg and 1.6apg. He also holds two passports: Danish and Ivorian. #5. Samuel Amed Diomande (193-G-88, currently plays in Norway) couldn't help Ammerud Bskt (3-14) in their last game. Despite his very good performance Ammerud Bskt was crushed 104-80 in Bekkestua by the higher-ranked (#3) Baerum Basket. Diomande scored 17 points, grabbed 7 rebounds and dished 5 assists in 31 minutes. It was Ammerud Bskt's sixth consecutive loss in a row. 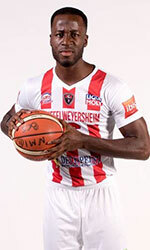 Diomande is one of the most experienced players in a team as it's his fifth year in Ammerud Bskt's roster. He has very impressive stats this season: 18.1ppg, 4.4rpg, 3.1apg and 2.0spg in 14 games. Diomande holds both Norwegian and Ivorian passports. #6. Yoann Louis Folquet (185-G, currently plays in Canada) managed to help University of Laval in a 3-point victory against the Stingers 77-74 in the U Sports in Wednesday night's game. Folquet recorded 5 points and added 4 assists in 28 minutes. This year Folquet's total stats are: 7.4ppg, 2.4rpg and 4.0apg in seven games. #7. Aboubacar Diallo (206-C, currently plays college basketball in the States) couldn't help the E.Illinois in their game against the Murray State University in the NCAA. He cannot count Thursday's game as one of the best ones. Diallo scored only 2 points and blocked 3 blocks. His team was crushed by 22 points 83-61. Diallo's total stats this season are: 2.0ppg, 2.2rpg and 1.2bpg. #8. Ricky Gouety (208-F-95, currently studies in the States) couldn't help the Stetson in their game against the University of North Alabama in the NCAA. He cannot count Saturday's game as one of the best ones. Gouety scored only 2 points in 6 minutes on the court. His team was edged 63-62. This year Gouety's total stats are: 2.0ppg and 1.6rpg in 19 games. #9. Ange-Michel Kuo (203-F, currently plays in NAIA) contributed to a 3-point Presentation College's victory against the Valley City State University 82-79 in the NStar in Saturday night's game. He scored only 4 points. It was his first game for Presentation College this season.